In our reservation form you can check “breakfast service”. Then, you can choose on what day(s) you would like to be served breakfast (between 8.00 and 10.00). Price: €25,- (for two persons). 2 crispy rolls, 2 sandwiches (brown), 2 croissants, Frisian ‘sugar bread’, 2 boiled eggs, pack of orange juice, carton of milk, meats and cheese, 4 pieces of fruit, butter, jam, salt, sugar, coffee milk, teabags (in small packages). Furthermore, a thermos with coffee and one with boiled water will be delivered. Breakfast plates, tea and coffee glasses and cutlery are present in the apartment. 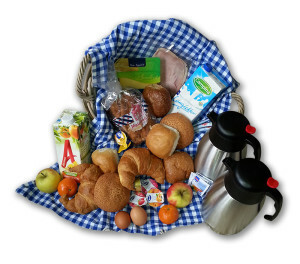 Afterwards, you can place the basket at the entrance of the apartment (before 12.00). Every morning a bag with fresh rolls (hard roll, soft roll and croissant) will hang on the door of your apartment by 9:00. Costs: €5,00 per person per day. You can order and pay your groceries at the Plus supermarket. We will ensure that your groceries are picked up and delivered in your apartment in ‘It Bûterhûs’. Products that should be cooled, will be placed in the refrigerator.